The health of children will benefit most from the sugar tax on the UK soft drinks industry, according to a study. It predicted if sugar was cut in the sweetest drinks in response to the tax, levels of tooth decay, obesity and type 2 diabetes would fall, particularly among the high-consumption under-18s. Researchers said the overall effect of the tax - due to start in April 2018 - would be modest but significant. 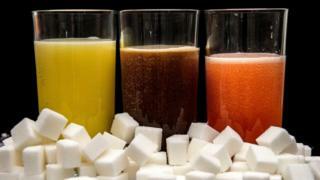 Soft drinks firms say there is no evidence a tax would cut obesity. The tax will be applied depending on the sugar content of drinks, so there will be no tax on diet drinks, a lower tax on mid-sugar drinks and a higher tax on high-sugar drinks. The Office for Budget Responsibility estimates the levy could add 18p to 24p to the price of a litre of fizzy drink if the full cost is passed on to the consumer. This amounts to an extra 6p on a regular can of Fanta and Sprite, and an extra 8p on a regular can of Coca-Cola, Pepsi and Irn-Bru. The study, published in the Lancet Public Health Journal, modelled different ways that the soft drinks industry could respond to the tax and then estimated what the likely impact would be on the health of the UK population. The study estimated that reducing sugar content in the sweetest drinks by a third and mid-sugar drinks by 15% could result in more than 140,000 fewer children and adults with obesity, out of a UK total of more than 15 million. This move could also lead to 269,000 fewer cases of decaying teeth and 19,000 fewer cases of type 2 diabetes every year, the study said. Passing on half of the cost of the levy to consumers, leading to a 20% increase in the price of high and mid-sugar drinks, was predicted to reduce the number of obese adults and children by 81,600, cases of diabetes by 10,800, and decaying teeth by 149,000. This would impact children the most because they are the largest consumers of sugary drinks. And it would result in an average reduction in sugar intake of 5kcal per person per day - equivalent to a third of a teaspoon of sugar. Reality Check: Would the tax cost 4,000 jobs? Sugar tax: How will it work? But Prof Tom Sanders, professor emeritus of nutrition and dietetics at King's College London, said this was "a very small reduction in energy intake". "It's equivalent to the amount of energy expended by one minute of brisk walking." The industry is likely to react to the tax by using a combination of all three responses, the study said. Dr Adam Briggs, lead author of the study and from the University of Oxford, said: "We must therefore be vigilant to ensure the food industry acts to remove sugar from soft drinks, and that where the tax is passed on to consumers, it increases the price of targeted products only - drinks with high levels of sugar." Prof Susan Jebb, co-author, from the University of Oxford, said the levy on soft drinks would not be enough on its own to solve the obesity problem. "We need to consider how to take effective action to reduce other sources of sugar in children's diets, notably confectionery, which has so far been relatively overlooked." Gavin Partington, director general of The British Soft Drinks Association, said there was no evidence that a tax on soft drinks would have an impact on levels of obesity. "The problem with this modelling is that it is based on the flawed concept that obesity can simply be attributed to calorie or sugar intake per se and consumption of one product in particular, rather than overall lifestyle and diet. "This error is plain to see given that sugar intake from soft drinks has been declining for several years now, down 17% since 2012." Reality Check: Would the sugar tax cost 4,000 jobs? Police say 290 people were killed and 500 injured in eight bomb blasts at churches and luxury hotels.